This article presents the octagon abstract domain, a relational numerical abstract domain for static analysis by abstract interpretation. It allows representing conjunctions of constraints of the form ± X ± Y ≤ c where X and Y range among program variables and c is a constant in ℤ, ℚ, or ℝ automatically inferred. Abstract elements are represented using modified Difference Bound Matrices and we use a normalization algorithm loosely based on the shortest-path closure to compute canonical representations and construct best-precision abstract transfer functions. 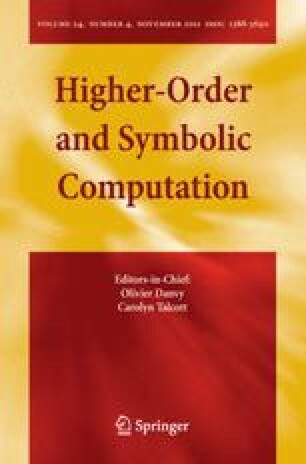 We achieve a quadratic memory cost per abstract element and a cubic worst-case time cost per abstract operation, with respect to the number of program variables. In terms of cost and precision, our domain is in between the well-known fast but imprecise interval domain and the costly polyhedron domain. We show that it is precise enough to treat interesting examples requiring relational invariants, and hence, out of the reach of the interval domain. We also present a packing strategy that allows scaling our domain up to large programs by tuning the amount of relationality. The octagon domain was incorporated into the ASTRÉE industrial-strength static analyzer and was key in proving the absence of run-time errors in large critical embedded flight control software for Airbus planes. This paper is the journal version of an earlier conference paper  sharing this title. However, the present version, extracted from the author’s PhD  is extended in many ways and enriched with new experimental results. Partially supported by the exploratory project ASTRÉE of the Réseau National de recherche et d’innovation en Technologies Logicielles (RNTL).